OORALA is inviting Aboriginal community members, UNE students and academics to join us on a field trip to the 2018 MYALL CREEK MASSACRE MEMORIAL CEREMONY. This year marks the 180th anniversary of the Myall Creek massacre. A memorial ceremony will be held at Myall Creek (near Bingara) on Sunday June 10 starting at 9:30 AM and going through to lunch. A free bus will depart Oorala at 7:00 AM and return to Armidale after lunch to be back at Oorala by 4:00 PM. The memorial will include Aboriginal dancers, a smoking ceremony, guided tours of the Myall Creek Massacre Memorial Walk and a performance by Mr Roger Knox. Morning tea and lunch will be provided to those on the Oorala bus. Saturday 9 June: Sounds of the Country concert at the Roxy Theatre in Bingara. 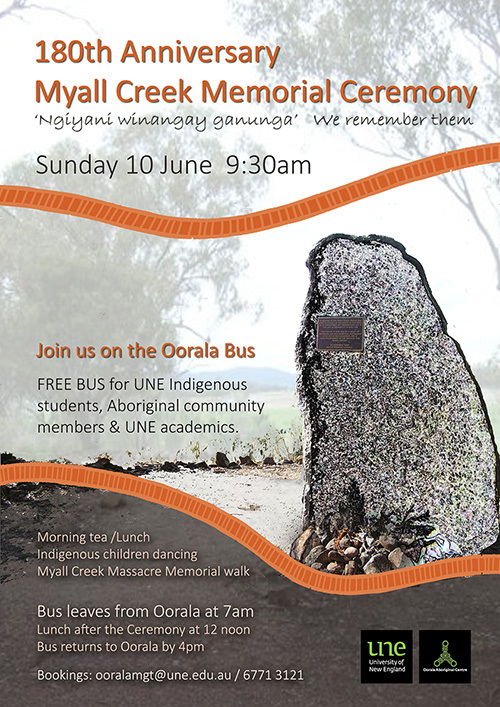 Sunday 10 June: the Oorala to Myall Creek bus for members of the local Aboriginal Community, UNE students and staff to attend the memorial event. Sunday 10 June: the 180th anniversary memorial event at the Myall Creek Memorial near the site of the massacre (near Bingara).